The Institute of Chartered Chemists of Nigeria (ICCON), has called on the University to join its crusade in sensitising members of the public on the dangers associated with the abuse of drugs. The Institute made this request during a courtesy call on the Management, where it restated its mission, mandate, activities, as well as the possible areas of cooperation between ICCON and the University. The Acting Registrar of ICCON, Dr (Mrs) Taiwo Bammodu, said it had been observed that Nigerians, through their activities continually endangered their lives due to ignorance and poor knowledge on the usage of drugs and chemicals. She said this was what informed the sensitisation and enlightenment campaigns being carried by the Institute; which is a parastatal under the Federal Ministry of Health that is charged with the responsibility of regulating the professional practice of Chemists in Nigeria. The Acting Registrar noted that Abeokuta, which is noted for Adire making; which involves the use of dyes, lamented that many artisans in the trade were still not well informed of the hazards of such chemicals. In view of this, she said ICCON was organising an enlightenment seminar in Abeokuta on the Globally Harmonized System of Classification and Labeling of Chemicals (GHS) and Drug Reduction Demand, which are aimed at providing information on the hazards of chemicals. The Acting Registrar stated that once the people, particularly, those at the grassroots level knew about the ills of drug abuse, it will be easy to curb it, as she called on the University to support ICCON in its campaign. 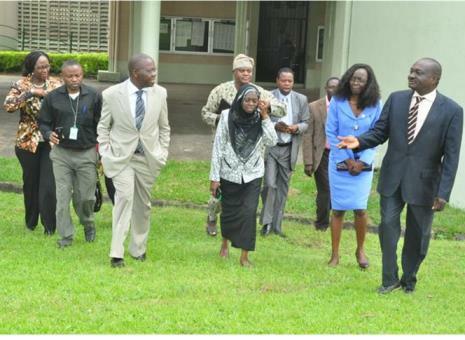 The Vice-Chancellor, who was represented by the Deputy Vice-Chancellor (Development), Professor Felix Salako, commended ICCON for its activities while assuring the Institute of University’s support. 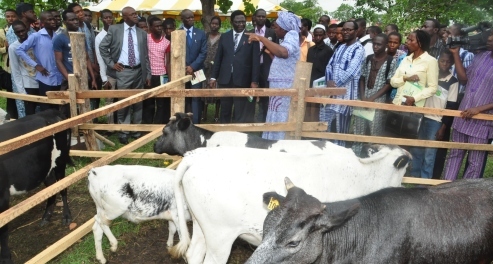 He disclosed that FUNAAB has its flagship in agriculture and as such, all the departments, except the College of Management Sciences had Chemistry components in their curricula. 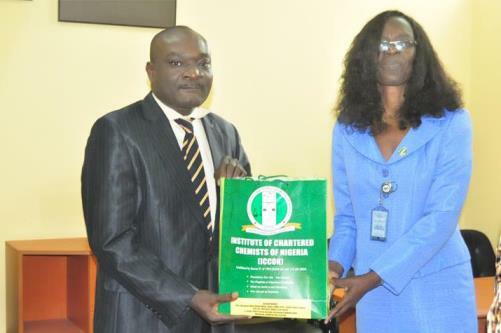 The Acting Registrar of ICCON, Dr (Mrs) Taiwo Bammodu (Right), presenting a gift to the DVC (D), Prof. Felix Salako, who represented the Vice-Chancellor at the occasion. The Vice-Chancellor added that the University is blessed with very active researchers in the field of Chemistry as well as students, who have distinguished themselves in learning and in character and promised that the clarion call by ICCON would be communicated appropriately.